The publisher is going to spread itself less thinly in the future, but apparently still has room for new IPs and ideas. The more things that you try and do at once, the less time and resources you have available to allocate to them. It's not the most complicated truth in the world, but EA says that will be keeping it in mind as it moves into a new financial year. At the company's annual showcase event in London, UK marketing director Stuart Lang said that EA's policy of working on fewer, but bigger brands had allowed it to consistently deliver high quality products and services. He said that EA had made great advances in the shooter market, doubling its market share, and had started the year strongly with Bulletstorm and Crysis 2. 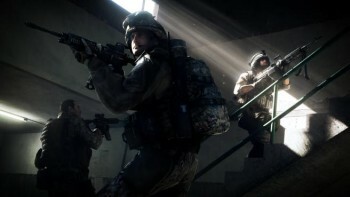 Lang also said that Battlefield 3 would be the "strongest release in the sector this year, and that as well as gains in the shooter market, Lang said that Hot Pursuit and Shift 2 had "reinvigorated" both the Need for Speed franchise and the whole racing genre. Lang also pre-empted concerns that the "fewer but bigger" policy would mean that EA would invest in fewer new IPs and genres, and pointed to Portal 2, American McGee's Alice: Madness Returns, Kingdoms of Amalur: Reckoning and Shadows of the Damned. It's worth noting, however, that only two of those games are actually new IPs. Madness Returns and Portal 2 are both sequels, and in the case of Portal 2, a sequel to an immensely popular game that EA didn't make and is in fact only distributing. The slightly disingenuous comments about new IPs aside, EA making an effort to make better games seems like a good thing for gamers. You'd be hard pressed to find anyone who's especially keen on hastily finished shovelware, and this policy - provided that EA sticks to it - would appear to be the antithesis of that.